This exhibition of work, this photographic epic, by David LaChapelle, is one that I watned to mount at all costs. It shows the speed with which, nowadays, one becomes an instant “classic”, and it is important that it is seen in Italy, in Milan. Not so much because, in the city’s need for a cultural renaissance – the Triennale having been reawakened with the Haring-Warhol-Basquiat triptych, and the Rotonda della Besana re-established with a show by Schnabel – the sanctuary of the Palazzo Reale also needed to be filled with the vitality of the most provoking and provoked, the most impetuous and inevitable contemporary art, but because, together with his capricious vision of contemporary society, David LaChapelle has, literally and with great formal coherence, composed his new and striking series Deluge inspired by Michelangelo’s frescos in the Sistine Chapel. This vast work, over seven meters long, is the most ambitious attempt to relate photography to the historical and unique function of these frescos, with an updated moralistic aim. Deluge is an allegory of the decadence of civilization, on its way to putrefaction. It’s useless to hope for salvation. The tragedy is complete. 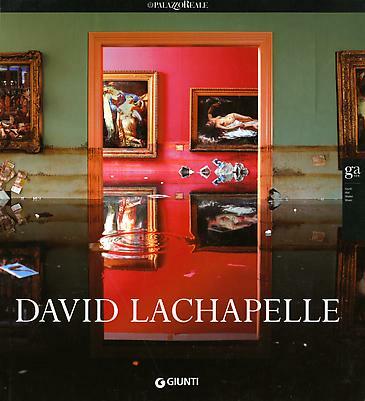 In this last piece by LaChapelle there is an extremely theatrical flavour and a wholly Mannerist type of vision. The very name seems to remind us of this: LaChapelle, the Chapel, and this is the Chapel par excellence: there is nothing to rival it. This is the reason why even the best artists no longer imitated reality but went back to this example of Michelangelo’s art and painted in “his Manner”. This was the case of the Mannerists and there was no way, even for the best of them, to avoid it: Pontormo, Rosso Fiorentino, Beccafumi. And probably without even being aware of all this LaChapelle translates into photographs the same, artificial, surprising, and sublime visionary principle as Pontormo’s Deposition in the Santa Felicita church in Florence. Imitations of Michelangelo all have the same effect of absolute unreality, of a dreamlike shift, something even more eerie in the work of the photographer because it is sifted through real models, photographically reproduced in poses inspired by the painting. Nothing is spontaneous, everyone is posed as in the staging of some opera and with allusion which, from Michelangelo through Géricault, arrive at Hyperrealism and Pop Art.